Arsonist Sentenced to L ife in Prison, LIVINGSTON, March 8, 2013 - Robert Earl Schiele, 40, was found guilty of Arson in a jury trial this week and sentenced to life in prison by that same jury. Schiele, who is on parole from prison, received a 20 year sentence from a Polk County jury in 1998 for two counts of Retaliation. In February, 2012 Schiele was living on rental property on FM 2457 with his pregnant common-law wife and four children. On February 6 Schiele failed to report to his parole officer in Huntsville. He was instructed to report on February 7. Early on the afternoon of February 7 Schiele called his parole officer and reported that his home had burned and he was not able to report. Schiele was apprehended a short distance away from the home. After an investigation of the circumstances of the fire and Schiele's activities, including his version of the origin of the fire, he was charged with committing arson in order to cover his failure to report. Upon being jailed Schiele tested positive for methamphetamine. 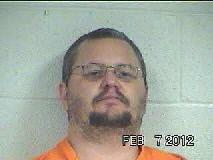 He admitted to his parole officer that he used methamphetamine on February 6. Schiele has a long history of violent criminal activities. In the early 1990's he was placed on felony probation for Burglary of a Building and Burglary of a Motor Vehicle. In 1995 those probations were revoked and he was sentenced to 4 years in prison. Less than a year later Schiele was free and committed a home invasion assault of a neighbor, for which he was eventually sentenced to the Polk County jail. His parole was not revoked. In 1997 he threatened physical harm to a police officer and murder of another person in retaliation for their involvement in his arrest on another assault charge. Although the jury found Schiele not guilty of the assault, the jury did find him guilty of retaliation and sentenced him to the maximum sentence of 20 years in prison. At the time Schiele was also charged with setting fire to another witness' house. That charge was later dismissed after the main witness could not be located and Schiele had been sentenced to 20 years for retaliation. Despite the 20 year sentence Schiele was again released from prison on parole in 2005. In 2008, while living in Norman, Oklahoma Schiele was convicted of Injury to a Child for striking his 6 year old autistic stepchild in the face. Schiele gave a false name to the police (that of his stepfather) and then reportedly fled the state. In statements given to police both Schiele and his wife claimed the child fell and hit his face on a toy box. Nonetheless, Schiele was later arrested and pled guilty to Injury to a Child, signing a statement admitting that he had used Aunusual force against the child. He was placed on probation for 5 years in Oklahoma. Based upon the Oklahoma conviction his Texas parole was revoked. However, Schiele only served another two and one-half years in prison before being released once more. In 2011 Schiele was sentenced to the Polk County jail for an August, 2011 incident in which he and three others severely beat another man, apparently over a disagreement concerning a drug deal. After his release in December, 2011 the parole board declined to return him to prison and Schiele took up residence with his family in the rental property on FM 2457. Child Protective Services were involved with the family but were apparently not aware of the 2008 conviction for injury to his stepson. Schiele was therefore allowed to live in the home with this child (three of the family's five children are his biological children). The children have now been removed and are currently in foster care. Schiele's wife was placed on probation in 2012 for methamphetamine and synthetic marijuana found during the arson investigation. These drugs were apparently purchased using funds from social security disability income for the autistic child. Schiele's wife is currently in jail on an application to revoke that probation. Schiele will be eligible for parole again after serving only fifteen years on the life sentence. Assistant District Attorney Joe Martin, who prosecuted the arson case, stated, "There is something seriously wrong with a parole system that repeatedly releases a violent offender, especially after a crime of violence against a child". 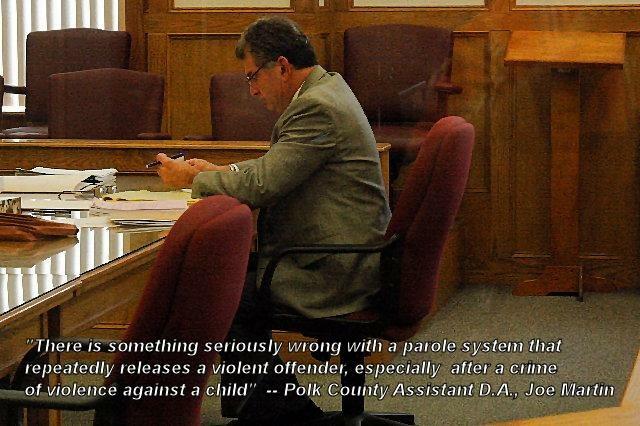 Martin continued, "Two Polk County juries have now each sentenced Robert Schiele to maximum sentences. I can only hope the parole board will pay attention and keep him for a lot longer than fifteen years".